Four more young Nigerians formally completed their Preparatory Programme at the SMA Centre in Kagoro, Kaduna State and will now move to the SMA House of Studies in Ibadan where they will begin their Philosophy studies. 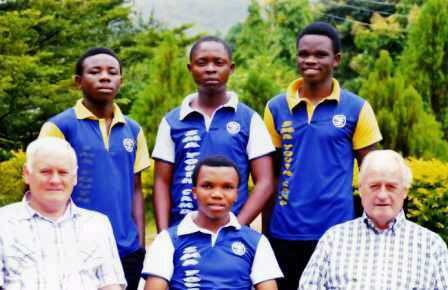 Back row: Cornelius Omini Fidelis (from Lagos), James Eneji (Benue) and Augustine Mak-Nworin (Ibadan). Front row: Fr Maurice Henry SMA (Regional Superior, Nigeria), Valentine Okoye (St Joseph’s Parish, Gowon Estate, Lagos) and Fr John O’Keeffe SMA (Director of the Preparatory Programme). After completing their four-year Philosophy studies they will then go to the International Spiritual Year programme in the Brésillac Centre, Calavi, Benin Republic for the next stage of their SMA formation. We wish them every blessing in their journey. Fr O’Keeffe has returned to Ireland to take up an appointment in Cork. He is replaced in Kagoro by Fr Colman Nilan SMA. Fr Colm comes to the task with vast experience – he has served in Africa for 31 years, most of it in Ghana as Parish Priest, Superior of the Formation House and as Deputy Regional Superior for the SMA team there. He moved to Nigeria in 2008 and has been the Spiritual Director at the SMA House of Studies in Ibadan. At weekends he has been in demand to assist in local parishes and to give Retreats to many religious communities in southern Nigeria. He also has a ministry to the inmates of the Ibadan Prison. Fr Colm now moves ‘north’ to Kagoro to help young men discover more about themselves, the Church and the Society of African Missions as they seek to understand more clearly what path the Lord has laid out for them. During 2011, the Society will ordain ten priests – coming from Ireland, Central African Republic, DR Congo, Ivory Coast, Nigeria, Poland and Togo. Fr Kevin Conway SMA was ordained in St Patrick’s parish, Dunamanagh, Co Tyrone on 18 June. He will leave for his mission in Kontagora Vicariate, Nigeria after holidays with his family. At present, he is visiting our SMA Houses meeting the FVC Sponsors who helped with the education of the 2011 class.